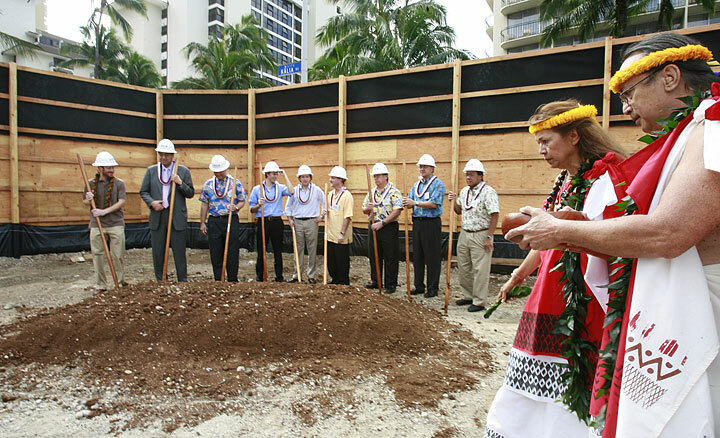 Steve and Marta Szilvassy, who live at 2115 Ala Wai Blvd., peered over the yellow tape yesterday at the groundbreaking ceremony for the Trump International Hotel & Tower in Waikiki hoping to catch a glimpse of their new neighbors. Neither the Donald nor his all-star daughter Ivanka, who bought a unit in the tower during the record sell-out sale in November, were among the dignitaries at yesterday's event, which was relatively calm compared to festivities surrounding the announcement of the luxury project. "We couldn't believe it when friends told us Trump was building a tower in Waikiki," said Marta Szilvassy. "Thank God, we bought our condo 10 years ago." Despite the construction noise and the removal of McDonald's and other restaurants and stores, the couple said they are looking forward to the completion of Outrigger Enterprises Group's massive Waikiki Beach Walk redevelopment project. 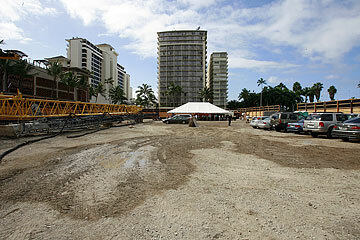 Trump Tower, slated for completion in 2009 on the corner of Kalia and Saratoga roads across from Fort DeRussy Park, is the cornerstone of the project's second phase. "It's going to make this whole area much nicer," Steve Szilvassy said. "It was old-fashioned and looking kind of run down." Trump, whose name has come to signify luxury, created a buzz that circled the globe last year when he announced his entrée into Hawaii's real estate market. He has put up similar towers in Las Vegas, Chicago, Miami Beach, Los Angeles and the Caribbean. Trump's other interests include office buildings, championship golf clubs, gaming, merchandise and his hit reality television show, "The Apprentice." Christie Adams, a former public relations consultant now pursuing a career in real estate, said she stopped by the groundbreaking because of curiosity about Trump. "I'm an admirer of Donald Trump," said Adams, who lives in Hawaii Kai. "I've read several of his books and I'm a student of his real-estate method." Trump's iconic branding will attract continued global investment in Waikiki, she said. The project already has met with unprecedented demand. Units sold out for a total topping $700 million in just eight hours, setting world records for the total dollars and number of units changing hands at a residential development on a single day. Buyers from Japan, China, Korea, Australia, Europe, Canada, Mexico, Hawaii and the mainland paid an average of $1.5 million for units. Prices ranged from the mid-$400,000s for studios to more than $9 million for three-bedroom penthouses. Honolulu Mayor Mufi Hannemann, one of the speakers at yesterday's groundbreaking event, recalled that he was skeptical when investment firm Irongate Capital Partners discussed bringing Trump to Waikiki. "When they said the name of Donald Trump, I said 'Yeah, right,'" Hannemann said. "And then they brought him to me." Hannemann said he told Trump that his investment in Hawaii would reap many benefits as "long as you treat my people properly and you utilize the aloha spirit in everything that you do." Hannemann said Trump replied, "No problem, I've done this all over the world."